Many organizations are setting workforce gender balance targets, quotas on corporate boards or expanding family-focused policies. But, is diversity and inclusion more than just setting quotas and targets? I was sitting at a dinner table with the CEO of one of the largest German firms with his wife and mine, and I thought this could make for an interesting evening. However, just at the serving of the dessert, before my dinner speech, the CEO’s wife asked: “And Mrs. Trompenaars what are you doing during a normal day. Her response was so fast that I knew trouble would be the result: “Oh after our third daughter, I decided to stop with my work at Armani as an Italian interpreter and focused on filling the gaps that my husband created with his continuous travel. So now, I educate myself in Spanish and Hebrew, tennis, the making of fashion hats and playing bridge. So much more fun than these boring jobs in business.” It was so silent afterwards that I decided to start my dinner speech a little earlier. Never heard back from this client. This incident made me aware of the fact that if you are in the luxurious situation of having more choices than looking for a paying job in business, you might end up somewhere else. Dutch women have been privileged in many ways. They have had more choices than women in many other countries. A recent OECD publication stated that female employment in the Netherlands has doubled from 35 percent in the early 1980s to 70 percent in 2016. However, much of this increase has been in part-time employment, as almost 60 percent of the employed women in the Netherlands are in paid employment for fewer than 30 hours per week. Working part-time can add to job satisfaction of workers, freeing up time for childcare or leisure activities, but it also means that women’s education and skills are not leveraged to their full potential in the Dutch labor market. Furthermore, the publication assumes that most educational processes we go through are there for a labor market, not others. I want to challenge this assumption for the sake of opening a new discussion about the lack of females in the top of most businesses. I would argue that in healthy societies, we need to create choices for men and women to work in such a way that gives them the meaningful activities. For some, it is money, for others, it is power and again for another group, it is about learning or social relationships or contributions to society. And these meanings are not only found in business but far often beyond. But from the perspective of business, I fully understand the drive for a more equal distribution between the genders. All research done in that direction points in the same direction. There is a high correlation between the percentage females in the top and the financial success of an organization. In their working paper “Is Gender Diversity Profitable? Evidence from a Global Survey,” Marcus Noland, Tyler Moran and Barbara Kotschwar argue, much in line with the results of the McKinsey Global Institute (2015) that a scenario in which women achieved complete gender parity with men could increase global output by more than one-quarter relative to a business-as-usual scenario. This correlation could reflect either the payoff to nondiscrimination or the fact that women increase a firm’s skill diversity.1 A number of countries, including France, Finland, Iceland, Norway, and Spain, have gone so far as to mandate female representation on corporate boards, and other countries are considering following suit. Several Asian countries are adopting similar policy responses, setting workforce gender balance targets, quotas on corporate boards and political leadership roles, or expanding family-focused policies. Unfortunately, it doesn’t seem to work if you stop after quotas and targets. In fact, it might lead to the opposite. The more the organization achieves parity at the top, the lower are the results. Obviously, because you should never hire people on a non-functional characteristic only, like gender, ethnic background or sexual orientation. But there is a basic dilemma at stake here. If we don’t hire on the basic of quotas, how do we get them in alternatively? Thomas and Ely2 suggested that if you stop after sheer quotas, you set the minority group up for failure. But it is obvious that if you don’t have quotas, status quo is prolonged forever. Once you get the new “identity groups” in, successful organizations need to make sure that the individuals are hired for jobs in which they can excel. So you put Japanese on jobs that help stimulate exports to Japan, young people in testing your newly launched digital products, and females in jobs where relationships are crucial for business. In short, the second step is making those you hired successful. But another problem emerges. The authors observed that the mobility of the successful individuals is decreasing because people cannot be transferred to another job that easily. In the long run, this creates a big problem. So what’s next? 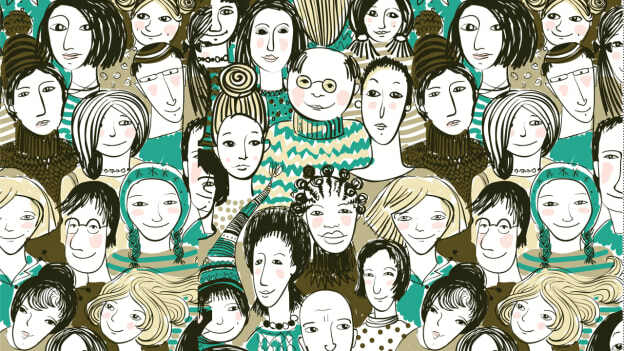 In several different types of US companies, the researchers looked into what makes sustainable success when dealing with a diverse workforce. In fact, it is the combination of linking the need for a diverse workforce with a key business challenge like innovation or internationalization with the quality of leaders to execute this properly. Deborah Tannen, the American anthropologist has made much play with the fact that men seek to report specific facts, while women seek to diffuse relationships of rapport with others. This is as simple as driving down the road and the woman passenger asking her partner, “Do you want to stop for a cup of coffee?” The man answers “no” and drives past the coffee shop. She is annoyed. She would not have asked him if she did not want to stop. Her question was an invitation to negotiate. His answer was strictly factual. She asked him what he wanted. He told her. Note how tacit is the rapport sought by the woman, while his answer is explicit. In her later book “The Argument Culture”, Deborah points out that while men are keen to debate and score points off each other and where possible demolish the points made by the opposing side, women are more interested in solutions and in the two parties accommodating each other. In practice both are needed, initial conflict to clarify the choice followed by negotiated consensus between these complementary values. If this is true, then businesses too need solutions rather than adversarial stand-offs, verbal jousting, and doubtful victories over rivals — we can gain insights by cross-connecting these value dimensions. In dealing with the diversity issue more effectively, Tannen argues that it is best to first go for positive discrimination like hiring minorities by complying to numbers but after that, to go for harsh and honest criticism. 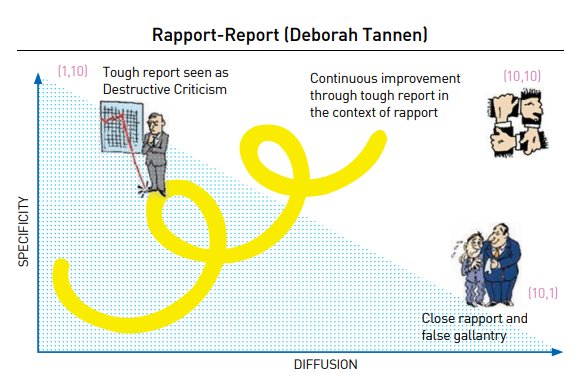 So report within the context of rapport. After reconciling Report with Rapport and Equal opportunities with Positive discrimination, it is time to link diverse viewpoints with a business challenge like innovation or customer orientation. What are these differences that need to be combined? Females and males maintain unique brain characteristics throughout life. Male brains, for instance, are about 10 percent larger than female brains. But bigger doesn't necessarily mean smarter; and no differences have been found in men and women's IQs, regardless of brain size says Daniel Amen, MD, author of Unleash the Power of the Female Brain. Disparities in how certain brain substances are distributed may be more revealing. Notably, male brains contain about 6.5 times more gray matter, sometimes called 'thinking matter", than women. Female brains have more than 9.5 times as much white matter, the stuff that connects various parts of the brain, than male brains. That's not all. The frontal area of the cortex and the temporal area of the cortex are more precisely organized in women, and are bigger in volume. This may explain a lasting functional advantage that females seem to have over males in language skills. Women have more connections going left and right across the two halves of the brain. This could give them an advantage in pulling together information from different sources and drawing conclusions. The left half of the brain handles logical thinking, and the right is associated with intuition. Men's brains have more connections from front to back, which may heighten their perception. They may be more attuned to what's going on around them so they can take action. We could go on much longer. And obviously these characteristics are found in both categories. There are males that outperform females on language and females outperforming males on spatial tasks. But much of the dominant research gradually comes to the conclusion that to increase the likelihood of high performance, it is about the dynamics between diverse talents. Some talents seem to be better developed than others if we cross gender. And the difference is made by leadership again. Diversity and performance. In this context, it is worthwhile to quote the work of Di Stefano and Maznevski,4 who developed a model based on Bridging, Mapping and Integrating (BMI) differences between diverse team members in order to enhance their performance. In the first Mapping phase, team members are encouraged to define the differences and similarities between the team members and how it may benefit team processes and performance. It ranges from differences in leadership style, personality, thinking style, gender, etc. During the second Bridging phase, there is a focus on the integrity of the communication process since many misunderstandings are caused by misinterpreting information by all parties involved. Understanding and a willingness to communicate from a neutral position can “bridge differences” and lead to positive decision-making. During the last phase of Integration, one assumes awareness of the differences and the importance of the communication bridges. Only then it is assumed that the team members can integrate the clear differences and work them to their advantage. This is done by keeping the differences intact and using them to achieve the similarities in goals. The organization can support this process by developing the right leaders who can guide this process effectively. An interesting finding in their research is if the leadership role is not done properly, the performance of a diverse team leads to lower than average performance. 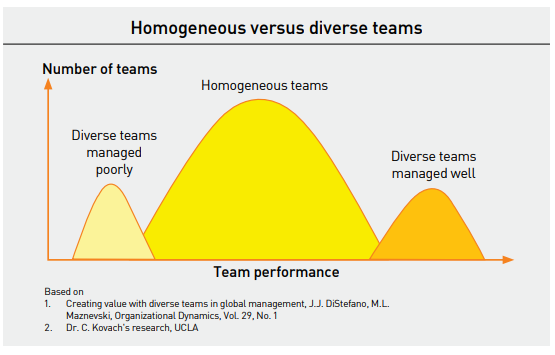 But when done properly, it exceeds the performance of homogeneous teams. Quite recent research from Daniel Coyle, as published in “The Culture Code”, reveals additional insights in what makes teams effective. In “The Culture Code” Daniel Coyle explores and concludes that “While successful cultures can look and feel like magic, the truth is that they are not. A Culture is a set of living relationships working towards a shared goal. It’s not something you are. It’s something you do.” In the beginning of his book, Coyle relates the fascinating research story about four-person groups tasked to build the tallest possible structure using marshmallows, a yard each of string and transparent tape, and 20 uncooked spaghetti. Surprisingly counter-intuitively, kindergarten teams dramatically and consistently outperformed groups of lawyers, CEOs, and business school students. In short. We have argued that both males and females need to have a choice where to be included as a diverse input into the process. And we truly hope that the choice, at least for some, will lead to joining the tops of business organizations. All research points to the same direction: gender diversity is good for business when it is directed and believed in from the very top of the house. We also argued that there is abundant scientific evidence that males and females are significantly different in both functional structure and behavior. But the difference in performance can only be made through great leadership synergizing between the differences. When setting targets (highly recommended! ), make sure that the selection criterion is not only one category of diversity like gender, generation or ethnic background. In the recruitment process, focus on the diversity you need for the business case and accordingly select people on that criterion. A diverse selection panel will get the unconscious bias out of the way. And by doing that you will see many more women will be selected. Like most change processes, diversity needs to be directed by the top of the house. Role modeling in particular the middle management can boost the efforts. Hold the executives and managers accountable for delivery and monitor and communicate progress. In terms of leadership, lots of attention needs to be given to basic principles like dilemma reconciliation and servant leadership. These are approaches to take advantage of diversity and by the process make people more inclusive. It is crucial that a gender diversity strategy is not happening in a false politically correct environment. At the end, people will commit themselves to it only when it helps them to improve their business imperatives. We need diversity for innovation. We need more females so we get a better grip on our advertising message for half of the market. We need more ethnic diversity because we want to globalize. These are the statements to be made. It becomes very important to have a diversity agenda that is linked to the purpose and core values of the organization. Within that framework, there needs to be ample room for local differentiation. If you are in the Netherlands, it is important to know that the preference for many females is to work part-time. And in other societies, it is not normal to put males or females in certain jobs, like the shift system or nursing – it is fine as long as the values of the organization and its strategy for success are not jeopardized. We have acknowledged the importance of leadership in this process. But it should not be a claim to divert everything out of your own sphere of influence. There are multiple levels of leadership in any organization of a decent size. Start with yourself to see what you can do and communicate the great results you have achieved in that arena. - Di Stefano, L. D., Imon S. S., Le e H., Di Stefano J. J. 2004. Bridging differences: a model for effective communication between different disciplines through conservation training programs for professionals. City & Time 1 (2): 1.